Recognize and solve negative patterns or you’ll end up solving the same problems over and over. The third time you have the same conversation, with the same person, about the same disappointing performance, you have a pattern, not a problem. #1. Point out the pattern. Purpose. Does the behavior or result matter? Expectations. How are expectations clear? Foggy? Clarity. How are goals clear? Foggy? Team composition. Are the wrong people on the bus? Management incompetence or confusion. 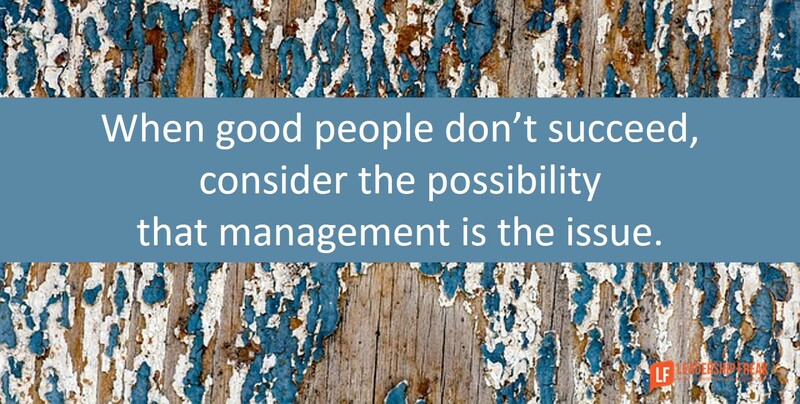 When good people don’t succeed, consider the possibility that management is the issue. Breaking negative patterns requires leaders to institute temporary measures. People need hope. Celebrate imperfect successes, even as you expect continued improvement. Hope energizes progress. How might leaders recognize and solve negative patterns with people? Continue to coach the person while managing the pattern. That’s the key for me. Step back from the wagon. Don’t just DO Something, Stand There. Get someone else’s perspective. Feedback is the breakfast of people who improve. The round wheels are already in the wagon. Patience wears thin we we have repeat conversations over the same issues! If they haven’t corrected their actions after the first discussion and the pattern continues, then you need to change course, “sometimes you need to clean house”! Depending on the simplicity or complexity of the group/organization their may be protocol you have to follow to reprimand, suspend or perhaps fire. If you “leave the apple rot” you risk losing the entire team. Take a stand, draw a line in the sand, do what is right for the organization, sometimes you have no choice then to fire the individual or group. Brilliant, and thank you, Dan. Too often we educate/train to develop “observable problem solving” and miss the critically more important education/training in “invisible problem solving,” the recognition and response to the underlying patterns that lead to the problems we focus on. We often don’t recognize that a deeper root of these patterns originates in the lowest common (and critical) denominators that define our organizations: individuals, and their attributes, values and thinking (their “culture”). A key to minimizing these “invisible patterns,” I think, is finding and developing individuals whose response to a challenge or crisis is asking: “What can I make from this Opportunity?” and acting accordingly. http://wp.me/p2k440-ju. Thanks again, Dan, for hitting a bullseye again. “When good people do not succeed, management might be the issue”. I appreciate and agree to this statement. I also agree that patterns are more important than problems. If pattern exists, problem will surface and not vice versa. So, understanding and changing the pattern is more important. One classic example could be, when good people start leaving the organisations, longest serving employees could be the reasons. It so happens, that such people influence and impress management by their power and connectivity. And leaders need to understand such pattern. Such pattern is hard to identify because on surface level everything looks right and convincing. Leaders can create good patterns and hence influence organisations for repeated success.If pattern is unhygienic, it leads to repeated failure. Very Well said ! ! !